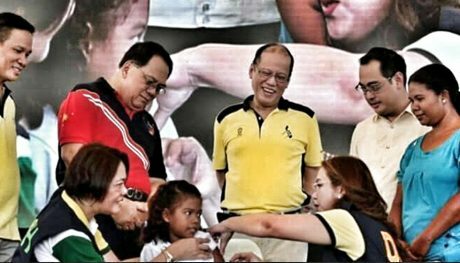 Then President BS Aquino with then Health Secretary Janette Garin in a 2016 dengue vaccination sampling for the cameras. Ever since she was fired from her post as Secretary for Housing and Urban Development Coordinating Council in 2016, current Philippine Vice President Leni Robredo has to keep the appearance of doing something “productive” lest the public forget her. She’s not doing much except attending ceremonial events and commenting on various issues that make the headlines. Her comments are mostly jabs at the current policies of President Rodrigo Duterte like his policy on his war on drugs. One can be forgiven for thinking that Robredo has taken the role of spokesperson for the Opposition. Instead of helping, what Robredo is doing is causing further conflict in Philippine society. She’s part of the current administration but since she’s often issuing statements against government policies, she comes across as an outsider. To be fair, Robredo is an outsider. She doesn’t belong to Duterte’s political party and has always been vocal against the President even during the campaign period. She’s a result of a flawed system of governance. She ran against Duterte’s own Vice Presidential running mate in the last election and is being consistent with her stand as a member of the Opposition. While Robredo has a right to speak, her own bias for her party mates, which includes former President BS Aquino get in the way of rational thinking. Take for example her statement addressed to the Duterte administration warning “don’t use ex-officials as scapegoat” to cover up government shortfalls. For someone who cannot move on from blaming former President Ferdinand Marcos who, by the way, has been dead for almost forty years, her statement is quite ridiculous and inconsistent with her own behavior. Instead of finding a solution to the issues she’s concerned about, Robredo simply tries to put the current administration down. Not that Duterte is into the blame game like BS Aquino, but he has the right to blame BS Aquino for the problems the Filipino people are still facing now. If Robredo can blame Marcos even when there had been five more Presidents after him who mismanaged the country, surely Duterte and the rest of the public can blame BS Aquino especially since a lot of the policies and contracts he entered into are still in effect. The Metro Rail Transit for instance, still uses the same maintenance provider that the previous government hired and contracted. The incorrect and unusable coaches for the MRT were also purchased by the previous government, which caused the public billions of pesos. How can Robredo not blame BS Aquino for that? It’s as if Robredo is contracted not to mention the previous government at all cost. Her partisanism makes it hard to see Leni Robredo as being part of the Philippine government. Even with the recent exposé that the immunization program rolled out two months before BS Aquino stepped down from office — a midnight deal, some would say — Robredo still refuses to tag him as the culprit. Her only comment was to ask the government to “probe bungling of vaccine program”. The said program involves the dengue vaccine Dengvaxia which was reported “to worsen the effects of dengue on people who had not been previously afflicted by the disease.” This is a disaster waiting to happen because most, if not all the 733,000 children and adults vaccinated have not been afflicted with dengue because it was promoted as prevention. She is right in saying someone should be held liable. Robredo is not helping at all when she attempts to cover up for her party-mates. She’s just delaying the investigation. The public can trace the timeline of events. The dengue vaccination program was not Duterte’s program. The error was discovered during Duterte’s term though. The investigation will lead to BS Aquino who was on record championing it as one of his “accomplishments”. BS Aquino and then Department of Health Secretary Janette Garin could also be sued for over charging the public because they reportedly spent P3000.00 per child on the dengue vaccine. It seems there is another crime that BS Aquino should be charged with. If proven that someone profited from this “program”, which is looking more like a scam, it will cement BS Aquino as a scam artist. The list of scams, which includes the pork barrel and disbursement acceleration program scams, during his term is getting longer. The dengue vaccination fiasco may not be the last in the list of fiascos that will be exposed as a result of Noynoy’s incompetence and disregard for the safety of the public during his six-year term. Sadly, we don’t know the extent of his government’s callousness. Fortunately, Robredo’s request to stop blaming BS Aquino government will fall on deaf ears because the public is now clamoring for answers for his crimes against the public. Some of us will be around to blame him, his equally incompetent and corrupt allies every time there is a valid reason to do so. She’s currently doing some damage control and PR statements with “We must investigate this” while not pointing any fingers or giving more details on who, where, what, when, and how this happened. On a side note, I find it really funny that the usual “pro-poor” advocates, who bleat out “EJK” at every available opportunity, are silent. Or are making knee-jerk excuses (not so subtle lawyering!) for the past admin. I imagine they would be screaming their throats bloody but, hey, it won’t be that fun if Duterte isn’t at fault. They’re not really silent though. One place I frequent (Inquirer’s comment section, a “good place” to accumulate stress) are saying things like “fake news”, “hairsay” [sic] (a probable pun to Aguirre) and stuff like “Kailangan mas tutukan ang EJK / 6B Shabu”. They’re rather still noisy over there, though not as noisy as when they think they have dirt on the Duterte admin. vaccines at Php 3000 per head for 700,000 people is more than 2 billion pesoses of the taxpayers money. They are practically swimming in taxpayers money. Read this blog coming from RJ Nieto (aka Thinking Pinoy) about the issue on the Dengvaxia controversy. BS Aquino is no “scam artist” because he is no artist in the matter of scams. In fact he is/was so inept that he should be compared to a pre-kindergarten child trying to paint the Mona Lisa using crayons and board markers. Robredo is just about as good at her (job?) as he was at his. Her single accomplishment in life was to marry a guy who died in a plane crash. Leni Robredo, is a Phony Vice President, elected thru fraud by the HOCUS PCOS and SMARTMAGIC voting machines, done by the most corrupt former COMELEC Chairman Andres Bautista. The recent recount of votes showed, she even lost in her home Province of Camarines Sur, on a large voters’ margin. Leni Robredo, should be aware of her own Naga Leaks. It stinks to high heaven. Just asking this questions : How can a Mayor of a ” third rated” city in our country, can afford to buy expensive condominiums in Metro Manila ? How can his wife, Leni Robredo, can afford an expensive and lavish lifestyle ? This woman cannot shut her mouth. However, she and her family are full of corruption ! Just as every time a new President takes office, the previous administration is castigated for its wrong-doings. 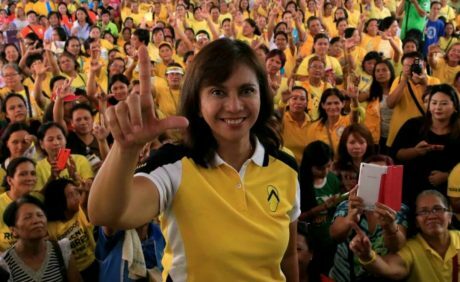 On and on it goes…it never ever stops……while the country is mired in the division created by Dynastic politics the author can still fail to see that ‘Partisanism’ is not peculiar to just Leni Robredo and that,in fact, it is the very fabric of the political system in the country and not something that disallows participation in that system, DUH !